Who knew that folksy ex-Veep Joe Biden was sitting on a dirty made-for-TV drama? 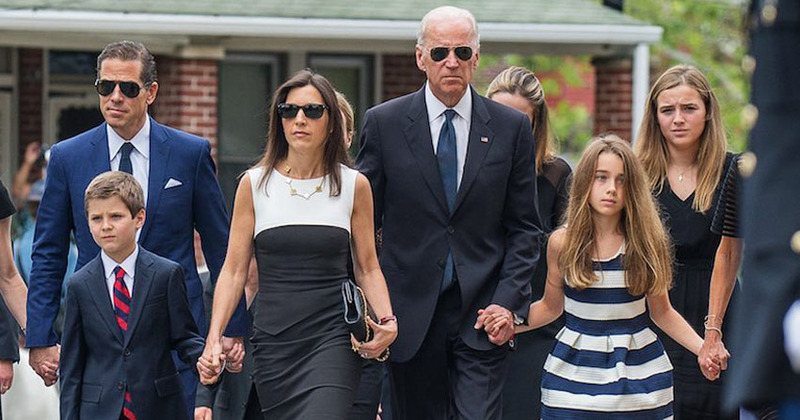 The news recently splashed across the New York tabloids that Hunter Biden, the surviving son of the ex-VP, is having an affair with Hallie Biden, the widow of Beau Biden, who died last year of brain cancer. She appropriately appears in all the family funeral pictures mourning alongside other family families. Two months later, Hunter’s now estranged wife, Kathleen, was out. And now, Hallie is in. As reported by NYP‘s Page Six, the divorce filings between Hunter and his estranged wife, Kathleen reveal so much more. Namely, the family’s got debt because of bad boy Hunter Biden’s questionable spending habits that allegedly involve drugs, hookers, strip clubs, incredible debt and an $80,000 bauble that has disappeared. In 2015, Hunter denied having a profile on Ashley Madison, the dating site for married people, despite the fact that the account was linked to his name and email. With five kids involved — three from Hunter’s marriage to Kathleen and two from Hallie and Beau — the family’s hot mess more than pulls at heartstrings. To be fair, divorces are ugly as hell. So likely there are no entirely innocent parties here. But in the meantime, how about those bounced checks to the housekeeper? Earlier in the week, news broke that Biden is openly in a serious relationship with Hallie. The couple even enjoys the blessings of Joe Biden and his wife, Jill. Every family has a black sheep. At 43, Hunter joined the military only to leave a year later after testing positive for cocaine use, as reported by WSJ. But not every family has a black sheep who takes up with his brother’s wife after he dies. Paging Lifetime….come on, what are you waiting for?